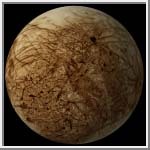 This animation of Europa was created from a mosaic of images taken by the Voyager spacecraft. Not all of Europa was photographed at a high-resolution. Consequently, many parts of the animation lacks the detail of other regions. This animation is Copyrighted © 1998 by Calvin J. Hamilton. Permission is granted to use it at home or at school as long as it is not for-profit. Any commercial/for-profit use of this animation needs to be addressed to Calvin J. Hamilton. High-resolution animations can be generated upon request.